The peroneal nerve is a large nerve that starts from behind your knee and travels down the outer side of your leg. The peroneal nerve sits close to a bone we call the fibula neck. In this region the nerve can be injured by compression from the soft tissue and bone. 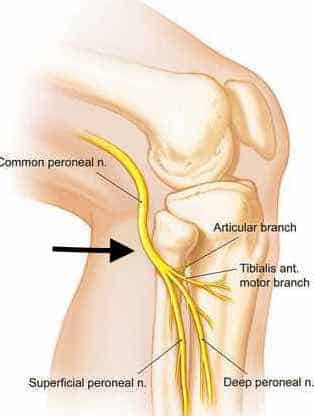 The peroneal nerve is also capable of being injured by trauma to the knee. Peroneal nerve compression is an uncommon cause of leg pain. 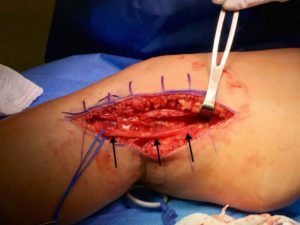 If your leg pain does not improve over time, or with various medications, then surgery to release the peroneal nerve might be necessary and is usually very successful. The peroneal nerve is one of the more exposed nerves in our body. It wraps around a bone on the outside of the knee. That bone tethers the nerve in position. That leaves the nerve vulnerable to repetitive stress injury(compression), injury during surgery, or injury from trauma to the knee. The peroneal nerve is responsible for controlling muscles which move your ankle and toes upward. The nerve also controls sensation or feeling on top of your foot and on the outside of your leg. Injuries to the nerve can cause very subtle pain, or it can cause paralysis and numbness. Pain on the outer side of your leg might be due to peroneal nerve compression. Some patients describe a long standing deep ache on the lateral or outer side of their leg. Some will develop numbness or weakness of the muscles that the nerve controls. Nearly every patient will have subtle differences. Making an accurate diagnosis of peroneal nerve compression or injury can be tricky. There are many tests we can order to determine if there peroneal nerve is the source of your pain. Those tests include and EMG which tests how well the nerve signals are working in your leg. But a normal EMG does not mean that your nerve isn’t being compressed. I have seen a few patients with a normal EMG who eventually responded very well to surgery to release the nerve. A careful physical examination is also necessary. During the examination we try to determine if your pain, numbness and/or weakness is because of a peroneal nerve problem in the leg, or perhaps it is a manifestation of compression higher up in your back. After an examination and necessary testing to assess the function of your peroneal nerve we can discuss treatment options. For those with issues due to a nerve injury, simply waiting for the nerve to recover may be all that’s necessary. For those of you with suspected nerve compression we may eventually chose to pursue surgery to release the nerve. During the surgery the nerve is located near the neck of the fibula and it is released as it enters your leg where it splits into many different branches. In some patients we need to trace the nerve back up your leg too. If the peroneal nerve was the cause of your leg pain then you should notice an improvement in your pain in a matter of a few days. If you had a foot drop or severe weakness it may take many, many months to see if the nerve will recover. In some instances, the nerve will not recover, despite surgery. Leg pain due to peroneal nerve compression is probably more common than we think it is. Often times, the very tests we perform to try and support our diagnosis will complicate the situation. In many of the cases I have seen over the years the tests we ordered were inconclusive, but we ultimately proceeded with a release and had very successful results. As we were taught in medical school. Sometimes you need to rely on your diagnostic skills and clinical suspicions.